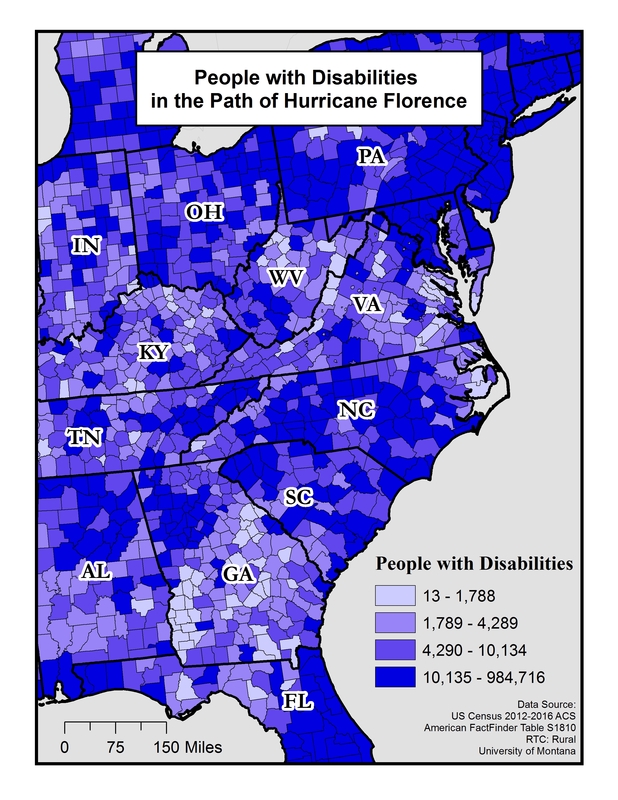 For more information about these maps, their use, and significance, see our blog post “Disability rates in the path of Hurricane Florence,” which was posted on September 14, 2018. 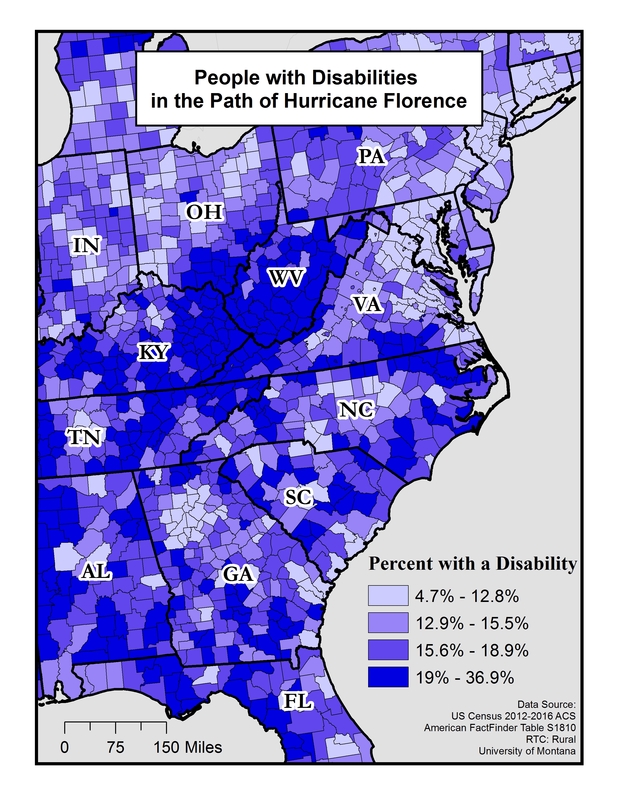 These two maps show disability rates in the counties that are in the path of Hurricane Florence, as well as the number of people with disabilities in the path of Hurricane Florence. Maps produced September 2018 based on 2012-2016 American Community Survey data. This map shows the percent of people, by county, estimated by the ACS to have disabilities in the Southeastern region of the United States. Disability rates are broken into four levels: 4.7-12.8%, 12.9-15.5%, 15.6-18.9%, and 19%-36.9%. Darker purple indicates a higher rate. The map shows counties just inland from the coast in North Carolina, South Carolina, and Virginia as having high rates of disability (19% -36.9%). This map shows the number of people, by county, estimated by the ACS to have disabilities living in the Southeastern region of the United States. Population is broken into four levels: 13 – 1,788 individuals, 1,789 – 4, 289 individuals, 4,290 – 10,134 individuals, and 10,135 – 984,716 individuals. Darker purple indicates a higher population. The map shows counties with large populations of people with disabilities (10,000 and more) throughout North and South Carolina, and the northern coast of Florida.